Title: To design, build and test V-I converter for given specifications. Grounded and floating load. AIM : To design, build and test V-I converter for given specifications. Grounded and floating load. APPARATUS REQUIRED: OPA544 Power Op-Amp, INA111 Instrumentation Amplifier, LF411 Op-amp, resistors, Thermistor. A voltage to current converter accepts the input in the voltage form (V i) & produces output in the form of current (I0 ).The output current is proportional to input voltage. Where A is called as the sensitivity of V to I converter, in Ampere per volt. The voltage to current (V to I) converters can be classified into two categories, depending on the position of the load. 1 V to I converter with floating load. 2 V to I converter with grounded load. fig shows a voltage to current converter with floating load. This load (RL) is called as floating load because it is not connected to ground. The input voltage is applied to the non inverting (+) terminal of the OP-AMP. Load resistance RL is connected in place of the feedback resister RF (in the conventional non inverting amplifier). 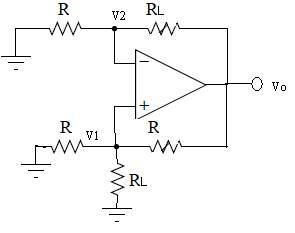 This circuit is also called as current series negative feedback amplifier. This is because the feedback voltage across R1 is proportional to the output current Io & appears in series with the input voltage. 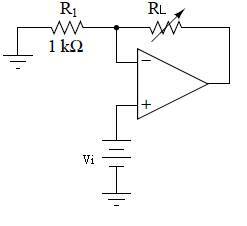 Sensitivity of this circuit is (1/R1). Hence sensitivity can be increased by decreasing the value of R1. Voltage to current converter is used in applications such as low voltage dc &ac voltmeters, LED & zener diode testers etc. This is the other type of V to I converter, in which one terminal of the load is connected to the ground. Design the circuit & connect it as shown in ckt diagram. 2. Apply the Vin & measure the current theoretically & practically. 3. Repeat the above procedure to take the different readings. 4. Note observation & plot the graph.